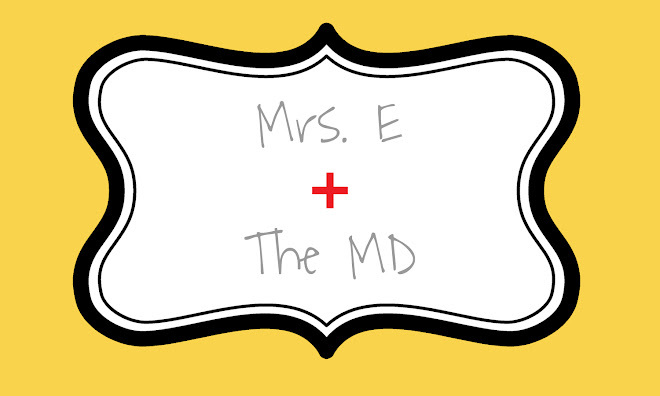 Mrs. E and the MD: Black Friday! Luke and I had a great Thanksgiving with my mom and dad. We ate and then lounged for the rest of the day. It was pretty relaxing. Mom and I decided to go do some Black Friday Shopping. We really hadn't ever done it before. We had nothing we wanted to be up at 4 a.m. for, but we were out at the mall by 8:30. It was crowded, but nothing compared to the Target parking lot. WOW. With that crowd I would have thought they were giving away free Peyton Mannings. We decided not to even attempt Target. We hit up Bath and Body Works (which had great sales and coupons) and though the line looked long, we probably only waited 15-20 minutes there. We went to Victoria's Secret, which wasn't bad at all. We also went to Old Navy. We got some GREAT deals there. Old Navy gets the big award of the day for best deals and assortment of sizes, colors, and styles. It wasn't too picked over, the employees were helpful, and you can't beat the prices. While we were in line, we heard someone say that the line to check out at Kohl's was 2 1/2 hours. There was nothing we really needed there, so we decided this would be our last stop. The biggest excitement for us came when the power went out! We were standing in Old Navy among hundreds of customers, and the store went dark. The entire mall lost its power. We laughed at first because we thought it was funny. Then the lights just flickered and didn't stay on, so then we started to get a little worried that we did all this shopping for nothing. Within a few minutes, the lights came back on and all was well. However, when we left and went to find a place to eat for lunch on McGalliard (because there are hardly any restaurants NOT on McGalliard), we noticed all the stoplights were out, and all the restaurants and businesses off the road were dark and had no cars in the lots. Obviously, McGalliard was experiencing a huge power outage during lunchtime of Black Friday. I felt bad for the businesses and restaurants that probably lost of a lot money and potential business. We ended up going to Scotty's in the village (along with everyone else in Muncie! ), but we didn't have to wait too long, and we had some great food! All in all, we were out for about 4 hours, including lunch, and we walked away with some great deals and gifts. After Luke and I got back to Indy, I had the urge to go back out and do more. I went to the Hamilton Town Center, going back to Bath and Body and Old Navy. Again, the stores seemed like they had PLENTY of merchandise even at 6 p.m. It was kind of nice-- not as crowded, but still all the great deals! I had to go to Target after, and that was just fine, too. 24 Weeks = 6 Months?